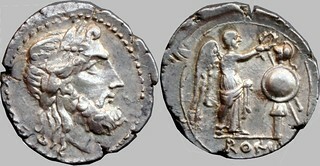 This is an educational site about Roman Republican coins and related books, and this page provides links to over two thousand coins, illustrated and described, including a complete history of Roman Republican Coinage,, and links to webpages where you can read reviews of hundreds of books and articles about the coins and their history. From time to time I write commentary essays and all these are archived on my blog page. The latest commentary article is at the bottom of this home page. There are also many original short essays, some that take a detailed look at a coin series, and others that chart the development of coinage from the Roman kings through the end of the Roman Republic. 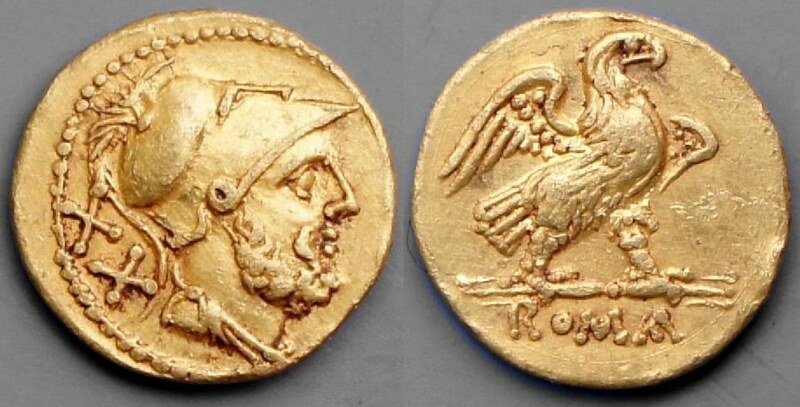 Numismatic literature is the right word for the books, but the spirit of this website aims for shorter words and a lighter approach. I wrote it just for fun, and comments about the books are subjective and my own opinion. If you have read something that I would like, or if you have a comment about this website, please contact me either via the yahoo group RROME or by clicking on any picture on this site and writing in the comment box, or by adding a comment in the box at the bottom of this page. If you would like to explore the complete content of this site please visit my homepage There is nothing for sale here. Happy reading! M.H. 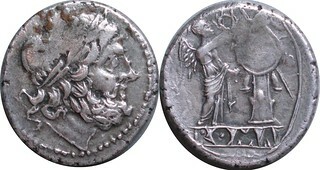 Crawford, Notes on Roman Republican coin types, Edinburgh coll. Michael Crawford, notes to the Edinburgh collection. I invite all to enjoy this new photo presentation, which complements the Crawford-RRC arrangement described at the top of this home-page! January 2013 - New home page structure, and Crawford RRC-based illustrated catalogue. This new home page is the most significant update since 2009, and addresses two major improvements, in the structure, indexing and navigation aids of my home page, and in introducing a Crawford RRC-based illustrated catalogue of Roman Republican coins, directly on this website rather than accessed via my photo database on Flickr. Whilst the content of my existing web-pages remains unchanged, I am retiring the historic index system which arranged my web-pages according to themes. The theme-based pages became, over time, too complex. However I have replaced these with a full listing of my current webpages, with a brief indication of their content, at the bottom of my home page (i.e. just above this commentary section). I also include direct links to my Flickr photo-sets on this page and on every other web-page on my site. 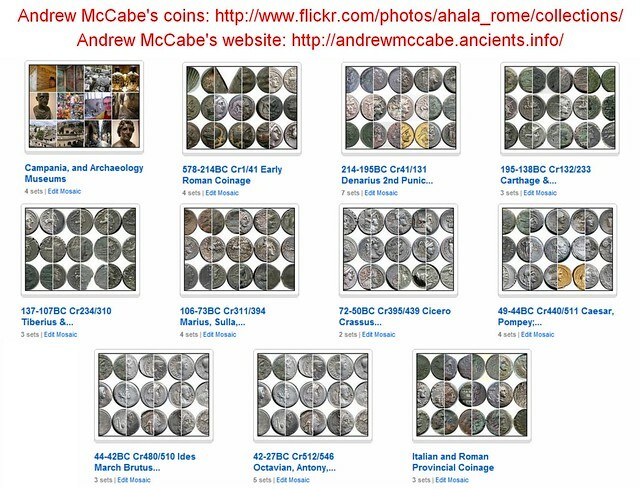 Second, there is a new presentation of coins of the Roman Republic, arranged strictly by Crawford RRC number, with photos shown to the correct relative scale and with my commentary. This new presentation can be found at the top of this home page broken into 20 sections arranged by RRC number. Each page within this new presentation includes the index to all other sections of the catalogue. 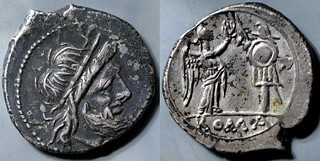 A key feature of this presentation is that all the photographs were taken against the same size background, so it is easily seen that all coins are exactly to scale. The first page covers Early Roman Coinage and the last, twentieth page covers the Battle of Actium and its coinage, with the history of Roman coinage unfolding between the two sections. The photos are shown in large dimensions, as per examples below, and the click-throughs lead to enlargements double this size. So these new web-pages will make the most of your fast broadband and high-density pixel displays! Please leave a comment about Andrew McCabe's website - add your name to the first box, and the comment below. All content copyright © 2004-2014 Andrew McCabe unless otherwise noted. If you've any questions or comments please contact me on the Yahoo Group RROME: http://groups.yahoo.com/group/RROME.